Trivia: Studied for 10 years at the Conservatoire de Paris. James Bond first spies the troubled Séverine as he dispatches with the assassin, Patrice, in a Shanghai highrise. Patrice and Séverine - puppet mastered by, Silva no doubt - stage an elaborate con, selling fake paintings; however, once the funds are exchanged, Patrice simply kills the buyer via long ranger sniper rifle. The pair next run into each other in Macau, China, when Bond goes in place of Patrice to retrieve a payoff from his yet-unknown employer. "How much do you know about fear?" Séverine quickly trusts 007 and gives him direction to her super yacht, the Chimera, sailing from Macau that night for her keeper's abandoned island. On board, Bond helps himself to more than a free ride, rendezvousing with Séverine in the luxury en suite of the yacht. Séverine is an aloof, enigmatic young girl with a dark history. She bears the marks of her work in the Chinese brothels, but has since sought refuge in the arms of the maniacal Silva in the hopes that she could transform her life. She desperately trusts 007 with her life and leads Bond to Silva's island, but the plan ultimately backfires, much to her determinate. Much like everything (and everyone) else in Silva's life, Séverine knows only too well that she is nothing more than a play-thing for the creepy man. Her only compensation is a last steamy fling with Bond, the mysterious secret agent who enters her life, albeit too late to save her. 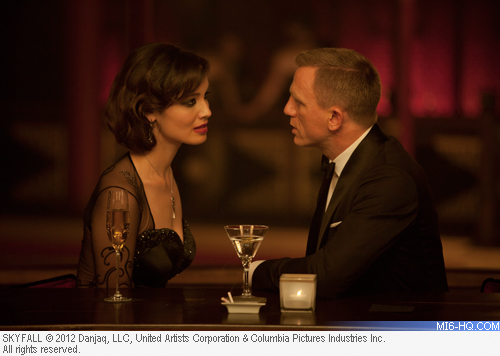 "Bond girls don't look like models, they have a specific 'look' - a look that fits the movie." "I watched the previous Bonds, the ones I didn't see, just to get inspired by everything, the universe, the music, but definitely not the Bond Girls, because I wanted to create a real human being." "When I heard there were going to be auditions in Paris I switched on my computer and tried to get contact details for anyone involved in this project - emails, phone numbers, whatever I could get hold of..."